Born in 1968, Liao is from Hunan province. She studied art at the Hunan Changsha Polytechnic University and was graduated in 1990. In 1993, Liao worked in Shenzhen Post, a local newspaper, as art editor. It was after working in the press for almost 20 years she decided to quit her job and became a full-time professional artist. 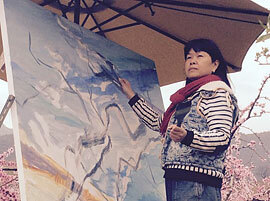 Liao is currently residing in Shenzhen and devoting all of her time in painting and art research work. Liao’s affection of the nature is vividly illustrated in her many artworks through the years. She is so fascinated by the nature that she always paints in the midst of natural surroundings. “I really enjoy painting under the sun, with fresh air and gentle breeze caressing my face and body. I take pleasure to cherish the serenity in the wilderness while my body and mind would dissolve spiritually to become part of the nature,” said Liao. “This is what the old Chinese saying said – The heaven and I become one … the pinnacle,” exclaimed Liao.